Celebrate Your Pancakes with a Side of Science! Happy National Pancake Day! A meal that is so amazingly simple to put together with a little flour, an egg, some milk, a small amount oil and sugar, and a few pinches of baking powder and salt . Behind the simplicity of America’s favorite breakfast meal lies an incredible, scientific transformation. That’s right folks, each day millions of people across the globe start their day with a little science! Have you ever wondered where the bubbles in your pancakes come from? These incredible little bubbles are what bring the words “fluffy” and “pancake” together as they were meant to be! In celebration of this most delicious holiday, we were curious to investigate what is going on behind this marvelous mixture & discover the scientific purpose behind the various ingredients of the incredible, edible pancake! Pancakes, like every other recipe, hides a story of chemical reactions that create new flavors and textures. With pancakes, the chemical reaction is between a leavening agent – such as baking soda & baking powder – & an acidic ingredient – such as buttermilk – producing tiny bubbles of carbon dioxide gas. These bubble form throughout the pancake, and are trapped as the batter cooks and solidifies. So instead of a leaden disk, you get a light and fluffy pancake honeycombed with tiny air pockets. The more of these leavening agents you add to a mixture, the more carbon dioxide will be produced, and the more bubbles will form. These pancakes have both ingredients, and are therefore especially fluffy. Once you have your tiny pockets of air bubbles, then comes the most complex and interesting part of the process. This is the Maillard Reaction, and it’s the step that gives pancakes their aroma, and that gorgeous golden brown color. When you raise the heat on your pancake mix, the amino acids that make up the proteins begin to chemically bond with carbon and oxygen atoms from sugars. The end result is a complex brew of hundreds of different aromatic flavor inducing molecules, that give your food a distinctive and rich palette of flavors. The Maillard reaction is behind the bold flavor of roasted coffee, the malty flavor of certain beers and malt whiskey, that brown crust on a perfectly cooked steak, the nutty notes of maple syrup, or the delightful aroma of freshly baked bread. What’s more, the Maillard Reaction works best in an alkaline environment (i.e. a less acidic one). So the secret to getting that golden brown color is to add more baking soda. Once you’ve added enough to neutralize the acidity of the buttermilk, anything left over will add to the browning. Here’s a brief run-down of the FUN science behind each ingredient of our favorite breakfast heavyweight! – Don’t overstir – Overstirring can cause the batter to lose too much of the CO2 that is formed, which will make them soggy and dense! 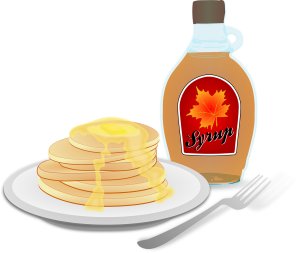 – You want a lumpy batter – If you overstir, too much gluten will form, which will make your pancakes too tough. – How many times to flip? – pancakes are best if you only flip them once! For more information on how pancakes work, check out this article from Serious Eats. Discover more FUN science with these great resources!